NOW ONLINE! Search manuscripts by type, century, culture, repository. View in a page-turning interface, and look at collation diagrams. Bibliotheca Philadelphiensis is the online home for documentation and progress reports on PACSCL’s medieval manuscript digitization project. BiblioPhilly (our nickname for the project) will result in the incorporation of high-resolution images of more than 160,000 pages of European medieval and early modern codices — virtually all of the holdings of PACSCL member libraries. These images will be freely available for downloading by the page, by the manuscript, or by the collection, under a Creative Commons license for you to reuse in any fashion whatever. 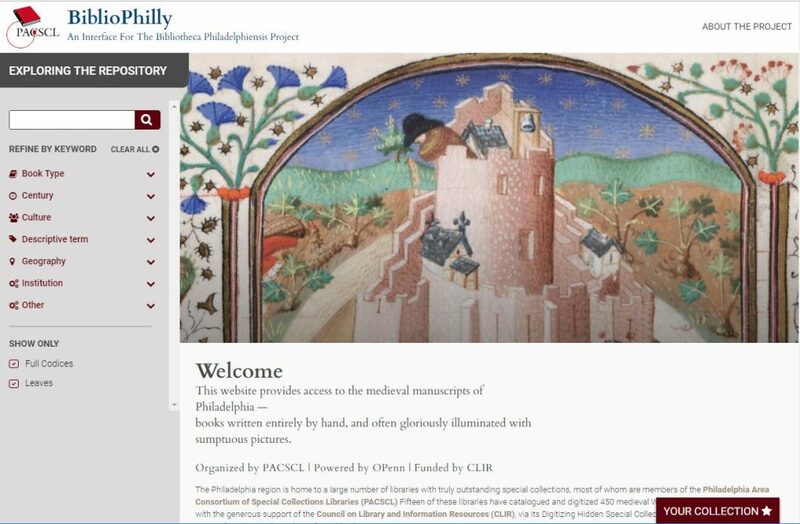 Our manuscripts will be stored on OPenn, which already has hundreds of manuscripts from the collections of the University of Pennsylvania Libraries and the Walters Art Gallery as well as other documents from PACSCL’s Digital Diaries Project. You can also follow our progress on Twitter, using hashtag #BiblioPhilly. This project was generously funded by a grant from the Hidden Collections initiative of the Council on Library and Information Resources (CLIR). The Hidden Collections initiative in turn is supported by The Andrew W. Mellon Foundation.